You are here: Home / Our Work / Business / Tech / ADM Tronics Unlimited, Inc.
ADM Tronics Unlimited, Inc.(ADMT) is an innovative leader in technology-based production that produces electronic components, assemblies and complete systems on a proprietary and OEM contracted or project basis for customers from diverse industries. Fake Plastic Websites was asked to completely overhaul their legacy site in order to align the company’s online visibility to it’s capabilities. The project’s content strategy proved to be challenging because ADMT’s innovation in the industry is complex and, dare I say, mind-blowing. 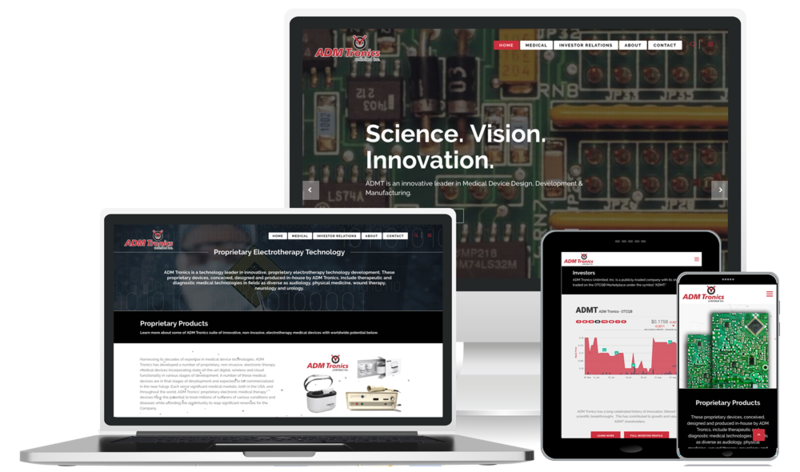 Their cutting edge medical device development and in-house manufacturing are changing how the medical field works so bringing that idea to life on a website was a daunting task. Check out the website at admtronics.com to see where we ended up.